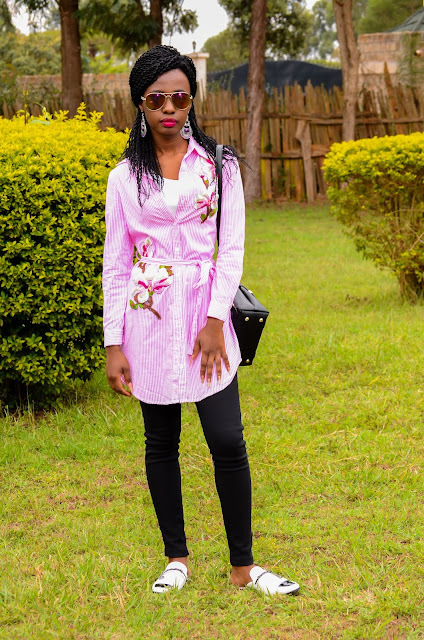 Finally, this post of this pink , embroidered shirtdress that I bought over a year ago is finally up. If you are thinking of how to wear a shirtdress with leggings then this is a good way to go. Wow, how procrastination works. 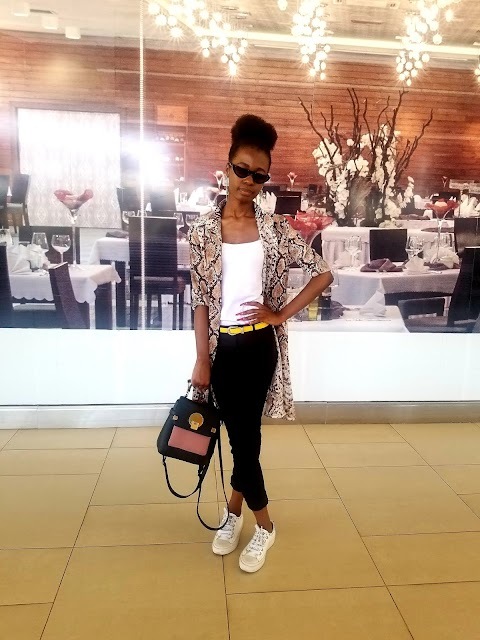 This should have been up some time back.Anyway the post is here and I am sharing this casual look today. A Tuesday but oh well. 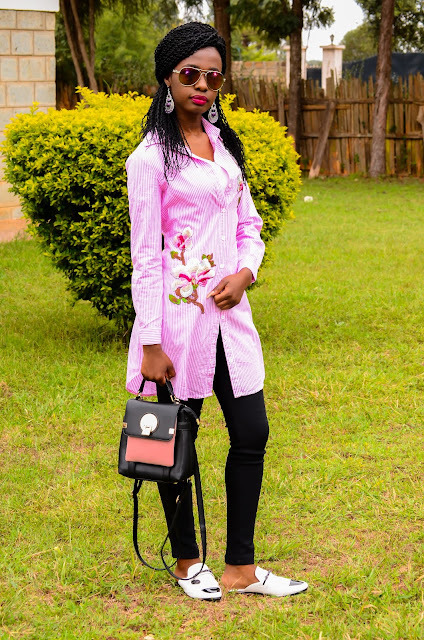 I bought this pink embroidered shirtdress from Shein, one of my favorite sites. They always do me justice because almost all the time their sizes are a great fit. I often go for an XS. So I already have this kind of shirt dress in a blue but the pink also looked so attractive and that's why it got to me and why I have this shirtdress outfit on today. I am the biggest fan of all things striped as well as anything embroidered so we need not say anymore. 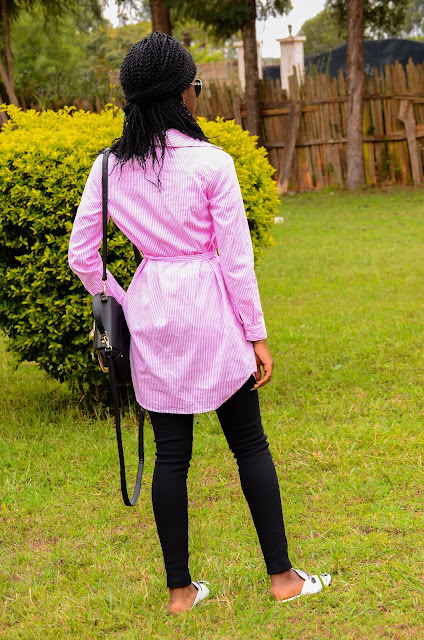 I styled the pink embroidered shirtdress very simply with just my black leggings and this nice pair of mules I got from Gamiss. I think wearing a shirtdress with leggings is an easy pairing.It always just has a way of working which is why I dress like this so often. 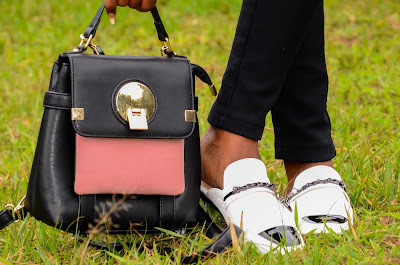 I also went for this Zaful bag that you have seen in a number of my posts by now. My earrings are from Rosegal. They are purple actually.Nice contrast going on there. 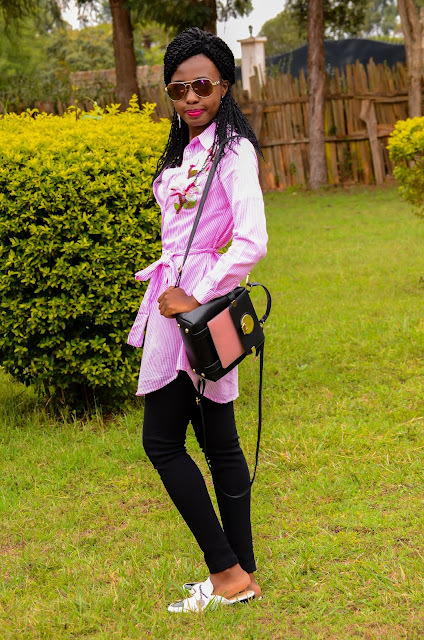 So another thing I love most about this kinda look, my shirtdress outfit, is that being so laid back, it has a nice youthful feel. See, I rarely wear jeans.Not because I hate them but I feel like leggings or jeggings allow me to effortlessly get a more polished casual look and as such I own so many in black. My hair looks so big here. It was freshly done and hadn't yet "settled" for lack of a better word, but it works aye. So I hope you love how I wore my shirtdress with leggings. 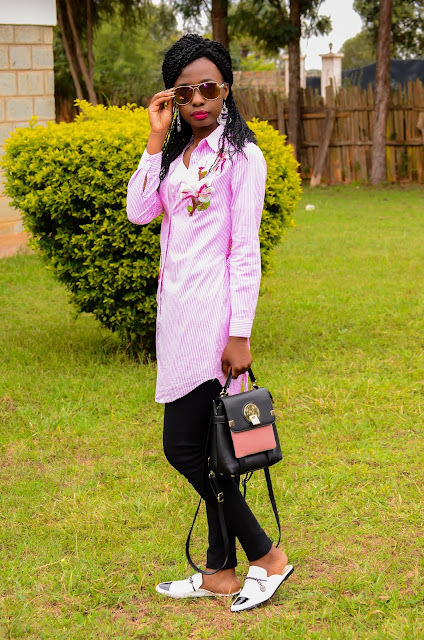 I love this pink shirt dress! Looks like it could be styled so many ways. Love this casual chic look Sophie! The embroidery on this shirt dress is so pretty! A beautiful and very elegant embroidered dress! I just love this dress on you. The length and pink pinstripes are so cute! 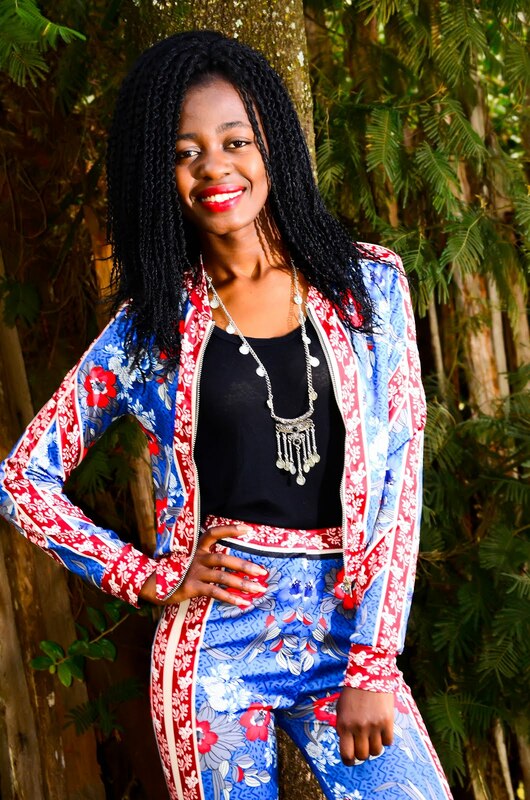 Love your look!! So chic! pretty! love you in pink!! So chic! Love the shirt dress! Very lovely on you! You look absolutely beautiful, Sophie!! What a cute top you're wearing! 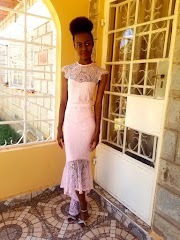 Such a nice dress, I love this shade of pink.